Google+ has a new feature: support for creating and managing events. Instead of copying Facebook's similar feature, Google decided to release a cutting-edge feature that's miles ahead everything else. Google+ Events integrates with Google Calendar, has support for beautiful themes and it's not just about creating events. The most interesting feature is called "party mode" and it automatically brings together all the photos taken by the guests. "Once you've enabled Party Mode on your mobile device, all of your new photos get added to the event in real-time. And as more guests turn on Party Mode, more pictures will instantly appear to fellow invitees. In this way Google+ Events gives your party a visual pulse; we've even added a 'live slideshow' you can proudly project during the event," explains Google. When the event ends, you can see everyone's photos in one place and filter them by popularity, the photographer or the tag. It's a great way to manage your photos, but the guests need to have Android phones and install the Google+ app. 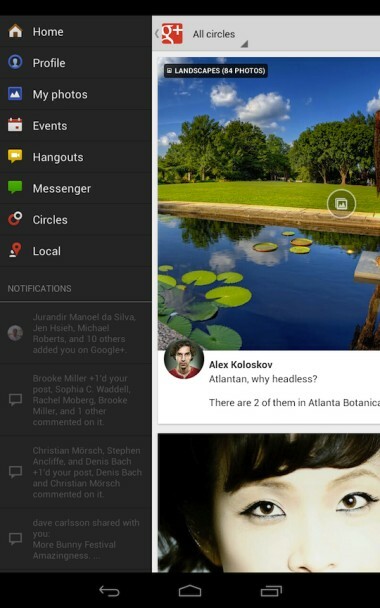 Speaking of the Google+ app, it's now available for tablets. Right now, you can only install it if you have an Android 3.0+ tablet, but the app will also be available for the iPad soon. Google says that more than 250 million people have upgraded to Google+ and the number of active users is 150 million. The active users spend about an hour per day at google.com and 12 minutes in the Google+ stream. Launched one year ago, Google+ seems to be pretty successful. Google has done it brilliantly. Though sadly, most of my friends are hooked to Facebook Events and they are unlikely to use this one. Let's see if I can push them to use it with an upcoming beer meet! well the problem is that the entire web seems to have an account on facebook. having 900 million plus users has its advantages! A big gripe we are experiencing here is that no-one can comment on a comment. Quite frustrating as that's actually the basis of a social network, isn't it? Will all this set of services be available WITHIN Blogspot pages? Because THAT WOULD BE AWESOME!!! Google Maps App for iOS?